Ann works in the business office, and you may talk to her on the phone. Her main duties include back-office functions, and she manages the financial aspects of the practice. Ann also helps schedule appointments and answer the phone. She also handles filing any insurance for special cases, like medical insurance. Ann's goal is to help make your experience in our office as convenient and easy as possible. Ann grew up in Rosenberg, TX and is a proud member of the Fightin' Texas Aggie class of 2002. Prior to working in the dental field, she worked in public accounting as an auditor and then in banking as a commercial loan officer. Outside of work, Ann enjoys cooking, spending time with friends and family, and being active outdoors, especially spending time on the water. Sarah is one of Dr. Cotton's chair side assistants. She will greet you in the reception area to take you back to the treatment room, interview you and take x-rays. One of her many duties is to make you, the patient, feel comfortable and at ease throughout your procedure. If you need anything during treatment, she will be there to accommodate you. 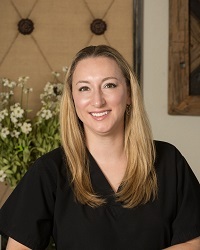 Sarah is always smiling, and she wants to make your endodontic experience as pleasant as possible. 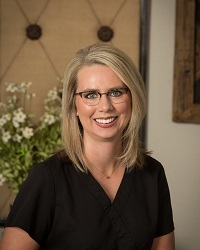 With her help chair side, our team is able to provide exceptional endodontic care. Recently Sarah has moved into a managerial role. You will likely talk to her on the phone, and her chair side knowledge has been a huge asset in helping patients and referring offices on the phone! Sarah grew up mostly on the East Coast, and she moved to Texas in 2015. When she is not working hard, Sarah enjoys hiking with her German Shepard, Sam, and traveling when time permits. They explore everything from old ruins to mountain tops. Vivian is one of Dr. Cotton's chair side assistants. She will greet you in the reception area to take you back to the treatment room, interview you and take x-rays. One of her many duties is to make you, the patient, feel comfortable and at ease throughout your procedure. If you need anything during treatment, she will be there to accommodate you. Vivian is always smiling, and she wants to make your endodontic experience as pleasant as possible. With her help chair side, our team is able to provide exceptional endodontic care. Vivian grew up in Spring, TX and moved to the Bryan-College Station area a few years ago. When she is not at work, she enjoys spending time with her family and baking. Vivian also likes to be outdoors - hunting, fishing, and camping - she enjoys it all! Nicole works in the front office so you will likely talk to her on the phone. Nicole will schedule appointments for you and answer questions. She will ask some basic questions over the phone in order to schedule your appointment. If you have dental insurance, she will obtain the information from you in order to call your insurance company to learn about your policy and what coverage you may have for root canal treatment. She also assists patients with the check in and check out process. If she does not know the answer to a question you may have, she will find out for you. Nicole's goal is to make your experience in our office as convenient and easy as possible. Nicole grew up in Giddings, TX but has lived in the Bryan-College Station area for the last 4 years. When not at work, she enjoys spending time with family and friends. Nicole also enjoys walking her dogs, Lacy and Oakley, and she likes to shop and travel! Brittney works in the front office so you will likely talk to her on the phone. 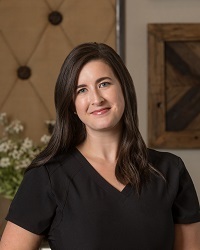 Brittney will schedule appointments for you and answer questions. She will ask some basic questions over the phone in order to schedule your appointment. If you have dental insurance, she will obtain the information from you in order to call your insurance company to learn about your policy and what coverage you may have for root canal treatment. Brittney will also file your dental insurance claims for you. She also assists patients with the check in and check out process. If she does not know the answer to a question you may have, she will find out for you. Brittney's goal is to make your experience in our office as convenient and easy as possible. Brittney grew up in Clatskanie, Oregon. She has also lived in Southern California before moving to this area. Brittney enjoys hiking, reading, and playing video games when she has time. Other than her young son, she is also mother to a black mouth cur (dog) named Dodger and a cat named Penelope. 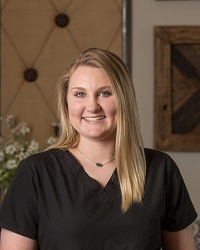 Ashley recently joined our team as one of Dr. Cotton's chair side Assistants. She has caught on quickly under the excellent training of Sarah and Vivian. Ashley will greet you in the reception area to take you back to the treatment room and interview you. One of her many duties is to make you, the patient, feel comfortable and at ease throughout your procedure. If you need anything during treatment, she will be there to accommodate you. 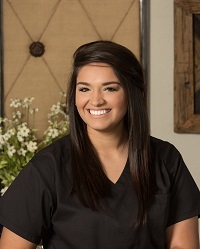 Ashley wants to make your endodontic experience as pleasant as possible. With her help chair side, our team is able to provide exceptional endodontic care. Ashley grew up in Caldwell and still calls it home. When she is not at work, she enjoys camping, riding ATV's or doing anything outdoors. Ashley also likes to go to the gym. Because she is the mother of 4 children, she stays busy outside of work!